Google Instant suggestions used to only include popular queries. Last year, Google started to show dynamic suggestions for the last words of your query. Now Google's suggestions seem to include excerpts from web pages. 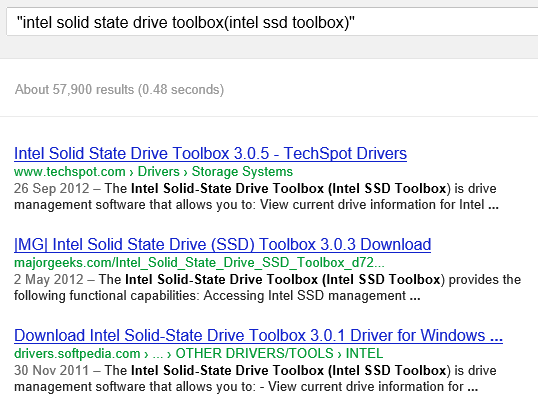 For example, when you search for [intel solid state drive toolbox], Google's list includes two strange suggestions: [intel solid state drive toolbox(intel ssd toolbox)] and [intel® solid-state drive toolbox download]. It's really unlikely that many people search for [intel®] or include redundant versions of the query. The real explanation is that a lot of pages include those texts and Google used them to enhance Google Instant. What about the standard navigation links used by Google or Bing? Obviously, they're included in a lot of pages and few Google users would search for boilerplate text and also use special characters. Google's help center page for autocomplete informs users that "Google's algorithm predicts and displays search queries based on other users' search activities and the contents of web pages indexed by Google". Sounds like an application of Google's ngram tools. This can be due to the browser extensions which let you search the selected text on a webpage. I find this change very useful for users like me who tend to search in vague keywords. This update makes it easier for me to find what I am looking for.